If you are asking for advice about water heaters for pools, the answer will probably be – anything but electric water heater. It is important to be accurate, because there are two types of electric pool heaters – classical electric resistance water heaters and electric heat pumps. Electric resistance water heaters are the least economic units on the pool water heaters market. Heat pumps, driven by electricity too, are almost at the other end of the scale, as the most energy saving water heaters. There are two reasons why we have put them in the separate chapter. The first one is because heat pumps use electricity only to transfer heat from air or water, and the second is the fact that electric water heaters heat pumps are commonly referred to just as „heat pumps“. Therefore, here we are talking only about electric resistance heaters that use electric current to produce heat. If electric water heaters for pools are so expensive to operate, why use them, what are the pros and cons, and how to choose the best one? To put it simply, electric water heaters might be ideal solution if the electricity price would be low. They provide heat in all weather conditions and operate fastest. Units are compact and lightweight. Purchasing prices are affordable. You will hear for electric pool heaters to be also used as spa heaters – actually, manufacturers produce units with different power – weaker are labeled as spa, and stronger as pool water heaters. All are suitable for smaller above ground pools, hot tubs, indoor pools, warm climate pools – where they will not be extensively used. If you find your pool in this group, let’s go shopping. Two manufacturers have been positioned on the top – EcoSmart and Coates. EcoSmart is a popular brand. Water heaters come in “spa” and “pool” options – Smart Pool 18 (18kW) and Smart Pool 27 (27kW) are stronger and designed for pools. For comparison with the other water heater types, it is good to know that their equivalent outputs are 61,000 BTU and 92,000 BTU, respectively. Units are equipped with digital thermostat, the latest flow sensor technology. Count on 1° to 1.5° F rise per hour, for average pool (up to about 15,000 gallons). Keep in mind also that you will need 200 Amp main breaker. 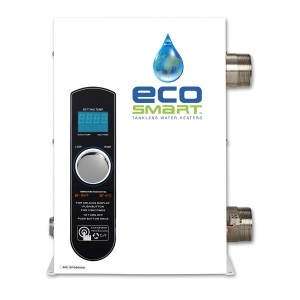 Prices for EcoSmart pool water heaters are $900 – $1000. Coates is the company with 70-year tradition in manufacturing water heaters and pool equipment. Their offer extends from 1,5 kW to 57 kW units for residential spas and pools and goes further to commercial 180 to 300 kW series. Find the calculator on their web site. Beside the proper size of water heater for your needs in kW, you will get insight in calculation structure and factors which effect it. Prices of the Coates water heaters are less affordable. For 18 kW pool water heater you have to pay $1.460 and 54kW heater, suitable for large pools and cold weather applications, costs $2,780. It is worth to mention two well-known companies, Hayward and Raypak, which has decided to offer only small electric water heaters. 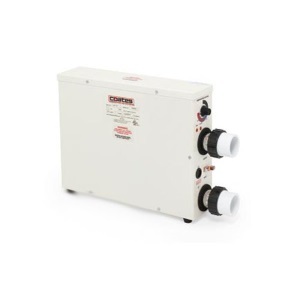 If you need 5,5 kW or 11 kW unit, check Hayward's CSPAXI or Spa-Pak products by Raypak. Although they are labeled as “spa”, these water heaters can warm up water in less demanding conditions. What is important to consider when you are buying an electric water heater for pool? Check the electrical wiring at your house and unit specifications, because you will need heavy-duty wiring associated with large amperage circuit breakers. Usually, the upgrade is required, which raises the cost for installing. Quality of the tank and heating elements – use of stainless steel is welcome, as well as protection of the other parts. Check what indicators and safety features are provided. After all, if you are not sure whether the electric water heater is for your pool or not, consider heat pump alternative – with equal usage it may cost up to six times less than electric resistance heater per month.